Combine wet and dry until just mixed. Bake at 350 for 20-25min – should spring back to touch. Remove and wait about 10min. Slice into 2-3 cm (3/4-1″) cookies. Place flat on cookie sheet and bake at 325 for 20-30 minutes – till crisp. 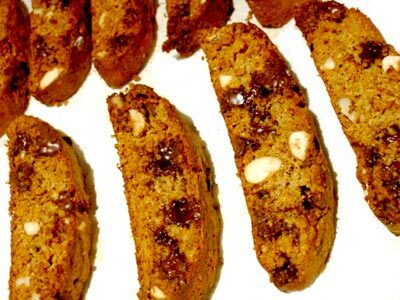 Flip the biscotti half way through baking. You can also bake cookies on a cooling rack for 10-20min, till crisp. When cool, store in a covered container. These keep for weeks.